Victoria claimed six of the seven gold medals on offer with Blake Agnoletto, Henry Dietze, Patrick Eddy and Max Leiner teaming to win the 3km under 17 men’s team pursuit in a national record time of 3mins 16.80secs. In a thrilling 3km under 17 women’s final, Victoria (3:40.42) edged Queens; and by just three-tenths of a second, with the quintet of Keely Bennett, Isla Bradbury, Hayley Jenkins, Kobi Merchant and Alessia McCaig celebrating the Big V’s second team gold for the day. In the sprint events, Tyler Puzicha (NSW) broke her own national record in the under 15 women’s flying 200m qualifying (12.576secs) before riding away to the gold medal over Meg Marker (NT). Marker, the sole competitor from the Northern Territory, also collected bronze on Thursday in the under 15 points race won by Lucy Stewart (VIC). While in the under 15 men’s event, Tarun Cook (VIC) set a national record in qualifying (11.719), but in the final was edged by teammate Alex Jones for gold. Max Leiner (VIC) made it two gold in one day when he won the under 17 time trial final, with Alessia McCaig (VIC) taking gold in the women’s final. Queensland enjoyed five medals on the opening day with Zakk Patterson collecting two in the team pursuit and time trial, while Western Australia and New South Wales collected three medals on the day. Max Leiner (VIC) claimed his third gold medal of the Championships with victory in the under 17 men’s 2000m individual pursuit to add to his time trial and team pursuit crowns won on the opening day. Leiner set a national record in qualifying of 2mins 15.353secs, and defeated James Derrick (WA) in the final. Alastair Mackellar (QLD) took the bronze. In the under 15 women’s event, Sophie Marr (VIC) edged teammate Jasmine Eddy (VIC) by just over a second in the 2000m final, with Isabelle Carnes (QLD) winning bronze. Like teammate Leiner, Alex Jones made it triple gold for the Championships after winning the men’s under 15 points race and time trial. Jones, who won the sprint on the opening day, took gold over Tarun Cook (VIC) and Ryan Britten (NSW). Dharlia Haines (WA) claimed gold in the under 17 women’s points race over Haylee Fuller (NSW) and Ella Sibley (SA). In the sprint events, Daniel Barber (NSW) claimed gold in the under 17 men’s sprint final over Alexander Allott (VIC) with Jack Opperman (SA) taking bronze. Alyssa McCaig (VIC) won the under 17 women’s event, with Deneaka Blinco (QLD) and Eliza Bennett (NSW) completing the podium. Victoria claimed all three endurance events on offer, with Patrick Eddy claiming the under 17 men’s points race by just one point over Lincoln Hey (NSW), with bronze going to Joshua Brodie (NSW). In the under 17 women’s individual pursuit, Victoria’s Keely Bennett (2:34.56) edged Olivia Saunders (NSW) by just under two seconds to take the gold, with Ella Sibley (SA) rounding out the podium. Alex Jones (VIC) collected his fourth gold of the week with victory in the under 15 men’s individual pursuit. In the final, Jones (2:32.145) was too good for teammate Tarun Cook (VIC), with Oscar Chamberlain (ACT) taking bronze. In the sprint events, Tyler Puzicha (NSW) added to her sprint gold with a win in the under 15 women’s time trial over Lucy Stewart (VIC) and Emma Stevens (QLD). In the team sprint events, Eliza Bennett (NSW) and Kalinda Robinson (NSW) won gold in the under 17 women’s final, with Dylan Eather (NSW), Daniel Barber (NSW) and Louis Stibbard (NSW) teaming to win the under 17 men’s. 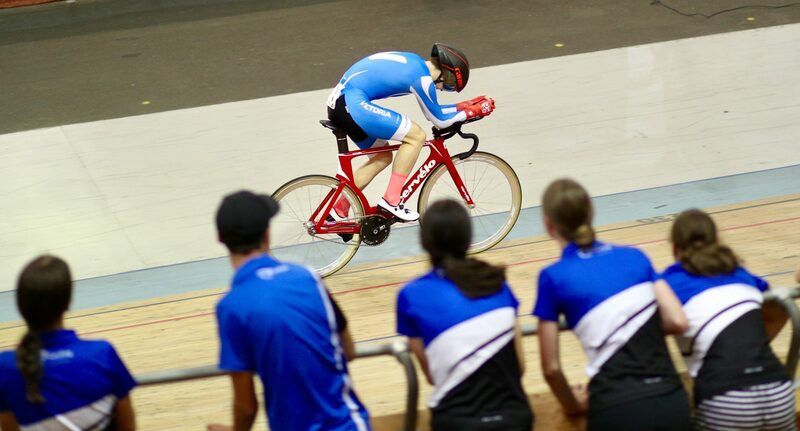 Victoria celebrated one of the most successful Championships achieved by a single state with a further seven gold on the final day of the 2018 Cycling Australia Junior Track National Championships at Melbourne’s Darebin International Sports Centre Velodrome. Victoria claimed 21 of the 28 gold medal events on offer across the four days, with NSW claiming five and South Australia and Western Australia each claiming one. The Champion of Champions awards in the under 15 events went to Alex Jones (VIC) who claimed five gold, plus triple gold medallist Lucy Stewart (VIC). Alessia McCaig (VIC) and Max Leiner (VIC), who each celebrated four gold and two silver for the week, were awarded the under 17 Champion of Champions awards. In other great individual performances, the sole competitor from the Northern Territory in Meg Marker won four medals, Tyler Puzicha (NSW) and Keely Bennett (VIC) each claimed two gold and one silver, Henry Dietze (VIC) bagged four medals including two gold, while Tarun Cook (VIC) collected five medals including one gold. On the final day of competition, the keirin titles were won by Lucy Stewart (VIC), Tarun Cook (VIC), Alessia McCaig (VIC) and Henry Dietze (VIC), while the scratch races were claimed by Lucy Stewart (VIC), Alex Jones (VIC), Ella Sibley (SA) and Max Leiner (VIC).